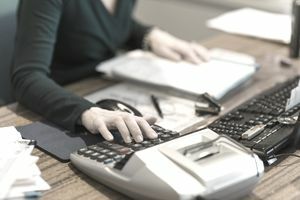 When a small business makes a financial transaction, its bookkeeper makes a journal entry in the accounting journal to record that transaction. Often, the transaction is recorded in the general journal or a special journal for the most active accounts. The most common special journals are the Sales Journal, the Purchases Journal, the Cash Receipts Journal, and the Cash Disbursements Journal. For many businesses, sales are generally credit sales or cash sales. Credit sales have a direct effect on accounts receivable, whereas cash sales directly affect cash. Between the two, cash sales are the easiest to account for. The transaction is complete at the point of sale, keeping track of the financial status is easy, and there are fewer journal entries. Here is an example of how to handle a double-entry bookkeeping journal entry for the cash sale of product or service. It is important to note that when customers pay with credit or debit cards, it affects the retailer's cash account and not their accounts receivable account. The total sale before taxes or subtotal is $67.00. The sales tax in your state is 6%, resulting in a sales tax due of $4.02. The post-tax sales total is $71.02. Here is the bookkeeping entry you make - using your accounting software - to record the journal transaction. First, enter a debit to cash for $71.02, and then enter a credit to the Sales and Sales Tax Collected accounts for $67.00 and $4.02, respectively. To ensure the accounting equation, Assets = Liabilities + Shareholders' Equity, remains balanced, the entries on the debit side and credit side should always equal. The cash disbursements journal is a book that businesses use to record all purchases made in cash. Examples are accounts payable, materials payable, and operating expenses. Columns are set up for each transaction as follows: date, check number, explanation, cash credit, other credit, account debited, accounts payable debit, and other debit. A deposit to the petty cash fund is posted to the cash disbursements journal, usually on a monthly basis. An accounting journal is a necessary detailed record of the financial transactions of the business. The transactions are listed in chronological order, by amount, by accounts that are affected, and in what direction those accounts are affected. Also, debits are generally entered before credits. Depending on the size and complexity of the business, a reference number can be assigned to each transaction, and a note may be attached explaining the transaction. The accounting journal is the place where the details lie. The general ledger is where you look at the big picture. A sample accounting journal page has columns for the date, the account, the amount of the debit, and the amount of the credit. What is Best: Single-Entry or Double-Entry Bookkeeping?